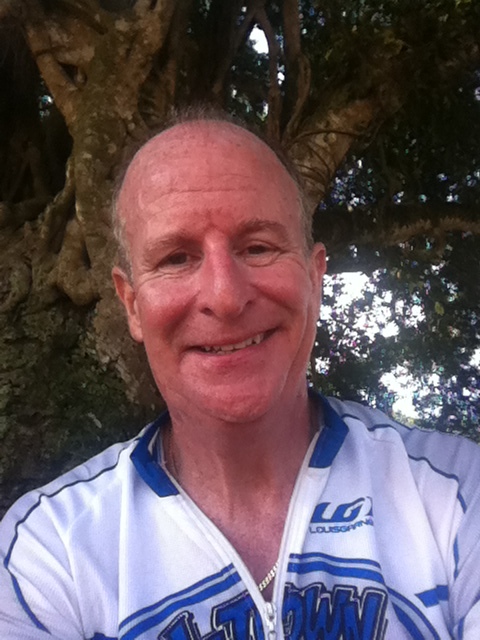 Steve Johnson and I had been taking bikes rides and having other adventures for a long time. 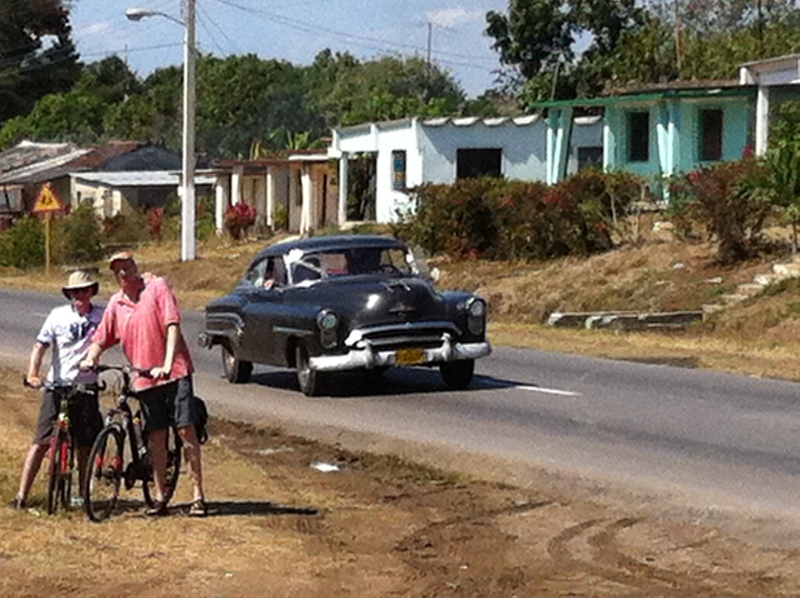 While our relationship was much more complex than just bike riding, our bicycle adventure to Cuba in March 2013 was just the last one in a shortened lifetime of bicycle adventures. We had already been taking long distance bicycle rides for several years when at age fourteen or fifteen we rode through summer heat and traffic from our houses in Virginia Beach to Military Circle Mall in Norfolk, a distance of about sixteen miles. It was probably the early summer of 1969 or 1970. This was in the era before we had even heard of ten speeds bikes, and if you had gears, there were only three. I was on the Black Beauty, a single speed Schwinn Typhoon with balloon tires. Steve was on the Red Flare, a distinctive Peugeot with 26 x 1 1/2″ rims that he had gotten while living in France. The trip turned to a disaster when my bicycle was stolen while we were looking for jobs in the mall. We needed to phone someone to come get us, but only had one dime between the two of us left for a pay phone call. His father was the only parent to answer the phone. Steve’s hilarious recounting of his father’s angry reaction at our whereabouts would for the rest of his life be one of a sackfull of stories that he was so good at telling. Steve always bragged that he saved my life in 1981, by “rescuing” me from my lonely existence in Houston. He convinced me to quit my air freight job and go with him and his Tulane law school classmate Tom Constantine on a seven week bicycle tour of Europe. That trip was certainly life changing for all of us, in so many ways that I cannot list them here. Tom met his future wife Esther when we encountered three Spanish girls in a Florence campground. I was to meet Tootie about a month after our return, when I moved into a house with Steve and Tom in New Orleans. Steve met Heather in New Orleans just a couple of years later. I was so proud to have my children growing up knowing both Tom and Steve and their families. Steve and I intermittently took bike rides together over the ensuing three decades. The two of us had a great weekend trip to Natchitoches, Louisiana in about 1985 or 1986. After bike riding all day, we stayed in a motel on the highway. We went out to eat, and rode back to the motel from the restaurant very late at night on a dark highway without bike lights. We got up early the next morning and rode again through the heat. Our bicycling relationship picked up when our children got older, and Steve and family returned from living in Saudi Arabia. Trips with Steve, usually including one or more of our children, and other close friends like Tom and Lyman, included Buffalo to Toronto, a five day bicycle tour in Maryland, and Buffalo to Syracuse. In 2007 I also was proud to have my son Henry and me join Steve and his son Hunter, along with Lyman, Jorgen, and Jorgen’s son Lars on a non-bicycling adventure: a backpacking trip in a remote area of southern Colorado. Steve showed his legendary style on that trip, when after collapsing from exhaustion at the top of a huge climb, he reclined in the dirt in his multicolored pants that would be more fitting on a golf course, and slurped sardines from a can. So it was with some history that Steve and I agreed to meet in Cancun on the afternoon of March 16. We were to fly to Havana the next day, to meet my brother Alex and our friend Lyman Labry, for a planned two week bicycle tour of Cuba. Alex was flying from New York, Lyman from Austin, and they were to arrive Havana one day earlier than us. My father’s favorite restaurant in Cancun was always La Dolce Vita, run by a Swiss Italian family. I had not been there in at least fifteen years, but mine and Steve’s meal this time did not disappoint. After dinner, we walked out into the night for a stroll. Somehow I stepped into a hole in the sidewalk, and hurt my foot. When we woke up the next morning I could not walk. We took a cab to a hospital for X-rays. The hospital diagnosed the injury (broken foot), put the foot in a cast and gave me crutches, just in time for the two of us to speed to the airport to catch our flight. 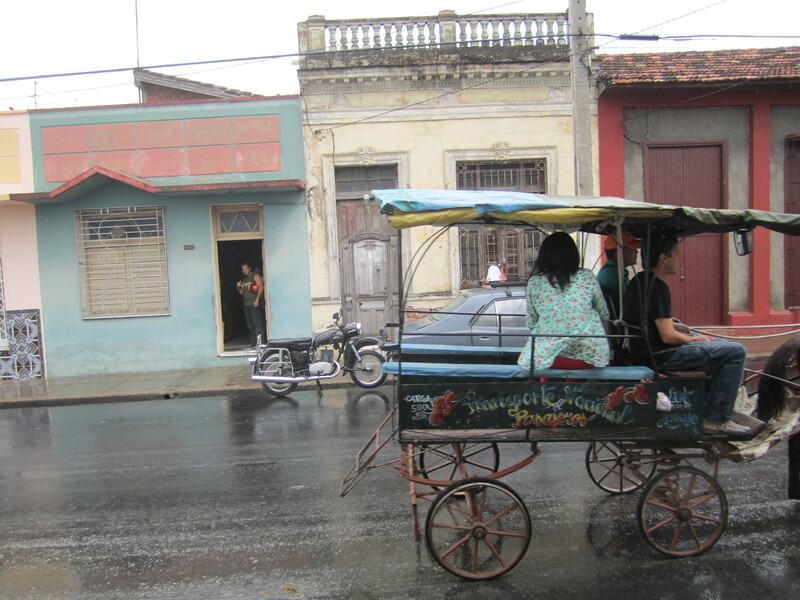 I clearly was not going to ride bicycles in Cuba. I figured I would not be getting back to Havana any time soon, so hobbled onto the airplane anyway. The plan evolved that I would travel with the three of them, but take public transportation instead, and meet them at the day’s destination town. The flight from Cancun to Havana took less than an hour. 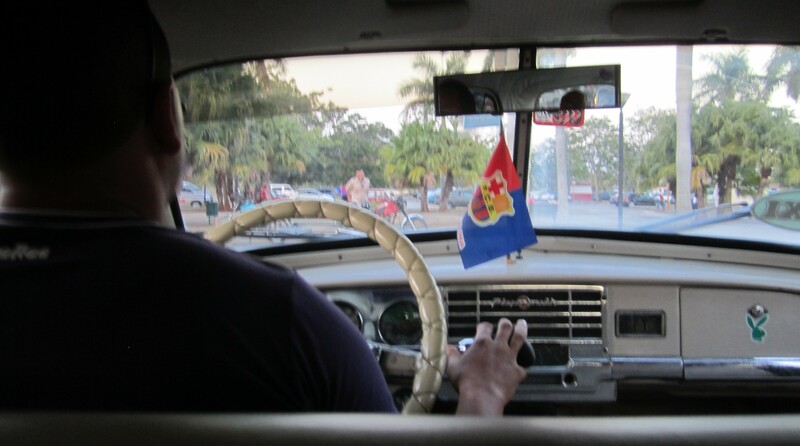 Steve and I arrived at the Havana airport about six that evening, and allowed ourselves to be hustled into a cab ride in a private car. It was a 1954 Plymouth. 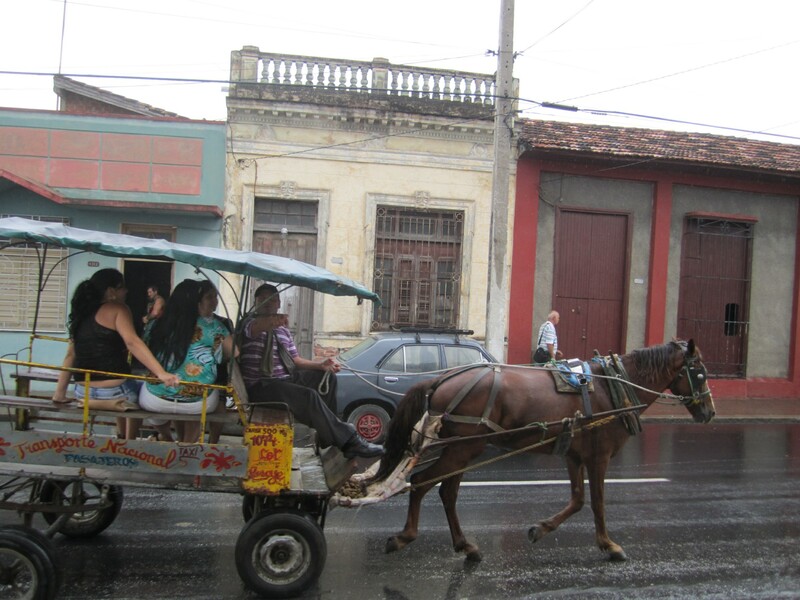 Because communication to and from Cuba is so difficult, we had to use our fall back plan, in finding a way to meet up with Alex and Lyman. The backup plan was to meet at the bar of the Hotel Nacional at nine P.M. The Hotel Nacional is a nineteen thirties gem with several bars to choose from. The floor show in the courtyard was in full swing by the time Alex and Lyman found us. We did not actually stay at the Hotel Nacional; every night on this trip we stayed at casas particulares, which is a government sanctioned program allowing rental rooms in private homes. Prices are fixed at the equivalent of about twenty eight dollars. I would recommend this program to anyone going to Cuba. 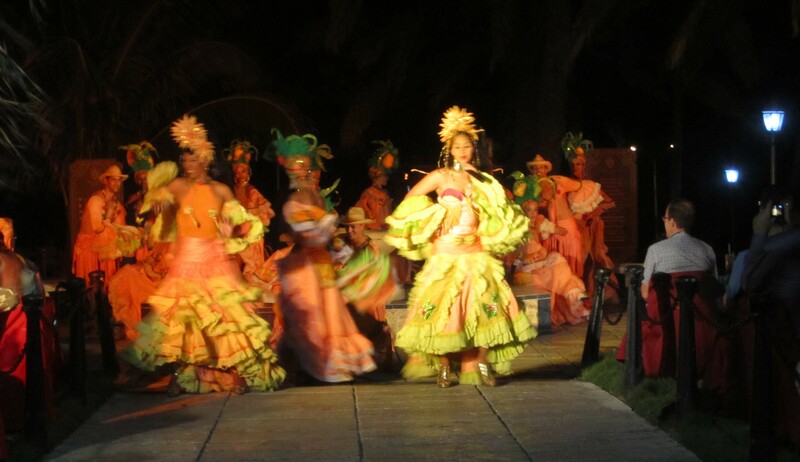 The floor show was not the only free musical entertainment we saw in Cuba. Pretty much every night, we saw at least one band, usually more than one. They often played in places frequented by tourists. However, the music almost always felt authentic and talented, not the expected tourist schlock. We enjoyed this excellent group in Cienfuegos the second night, in the lobby of a circa 1959 modernist hotel that we were not even staying at. Going with our original plan, with the bicycles underneath with the luggage, we took the first class Viazul bus the next day from Havana to Cienfuegos, where we would start bicycling. This is about two hundred miles east, closer to the center of the country. Books and blogs had advised us that this part of the country had the most pleasant cycling. 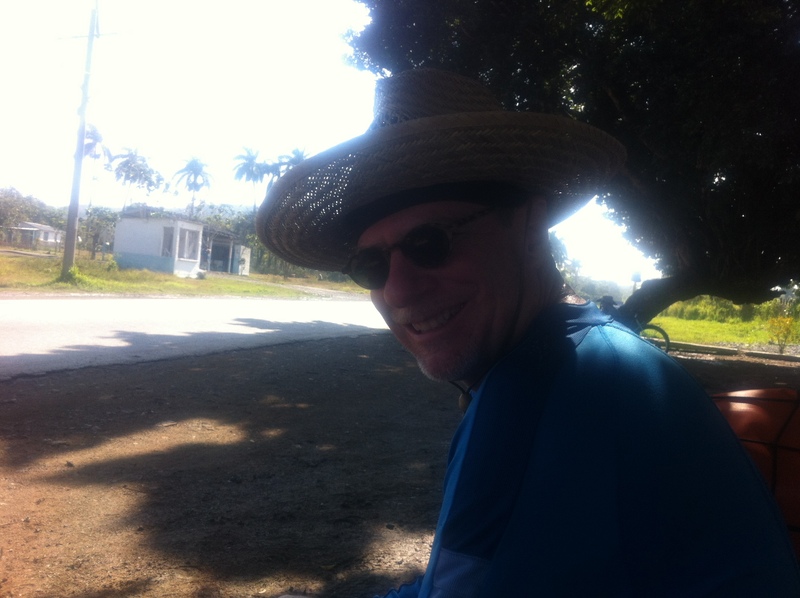 The first day of bike riding was to be a day trip from Cienfuegos, a loop to the coast and back. Steve, Lyman, and Alex had a great day and a true adventure. They stopped and swam in the ocean. There were no working cell phones on this trip, and all three guys lost each other for a while. They later found each other at a roadside restaurant that had excellent fried shrimp, tostones (fried plantains) and pina coladas. Alex played a song on someone’s guitar. It was getting dark when they arrived at a ferry terminal to see that the last boat had already left for the day. Hanging out in front of a hotel down the road, they somehow chartered a full size bus to take them and their bikes the fifteen kilometers back to Cienfuegos, all for equivalent of only eleven dollars. I stayed back at the casa, and took pictures out the window, watching the world go by. They next day the three of them rode quite a long way, almost all the way to Santa Clara. 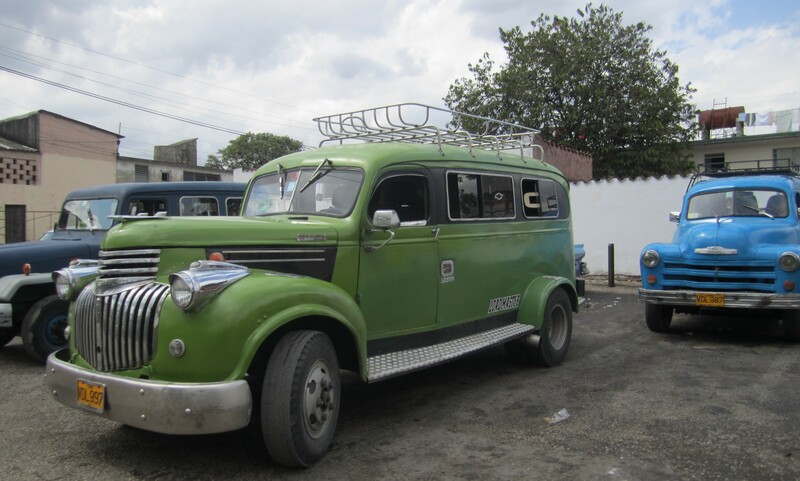 When they got very close, but were all pooped out, they hired this updated nineteen forties vehicle for the equivalent of nine dollars to take them and their bikes the last few kilometers. Everything in Cuba physically is stuck in 1959. The cars are about a fifty fifty split between pre 1959 and newer cars that have somehow slipped in. Pre 1959 cars seem to make better taxis. 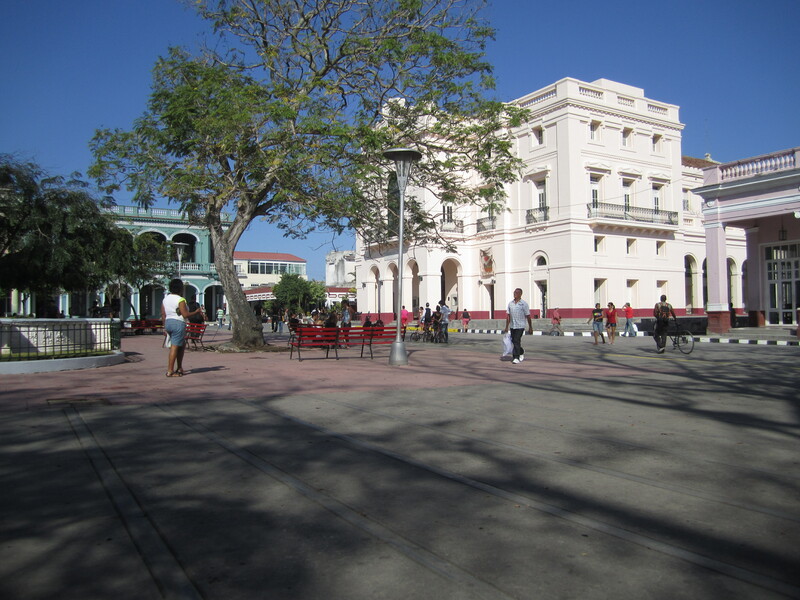 We decided to take the next day off from cycling and look around Santa Clara, which is known as a college town, having the second largest university in Cuba. 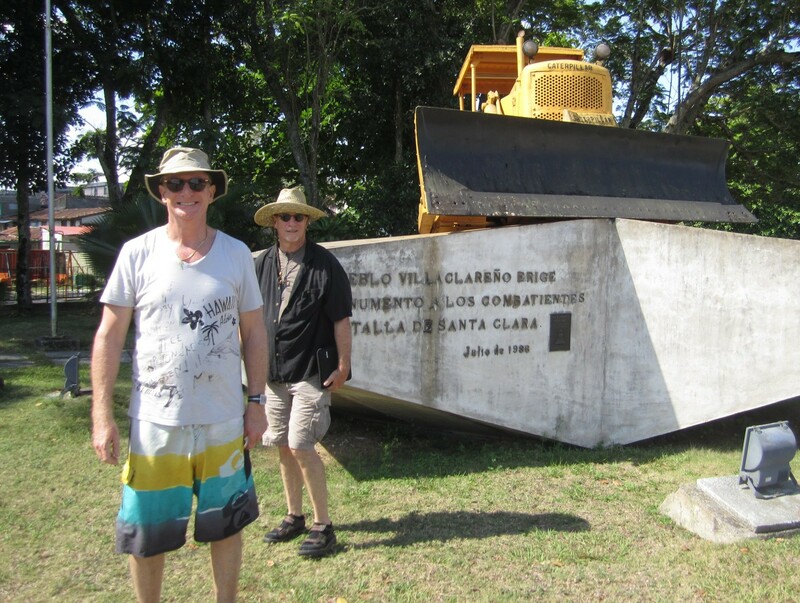 It is also the site of Che Guevara’s victory in the 1958 Revolution, where one of his small battalions of eighteen men used a bulldozer to wreck a government armored train. After the three hundred fifty government soldiers on the train surrendered, the dictator Batista, who was back in Havana, saw that his prospects were limited, and fled the country. 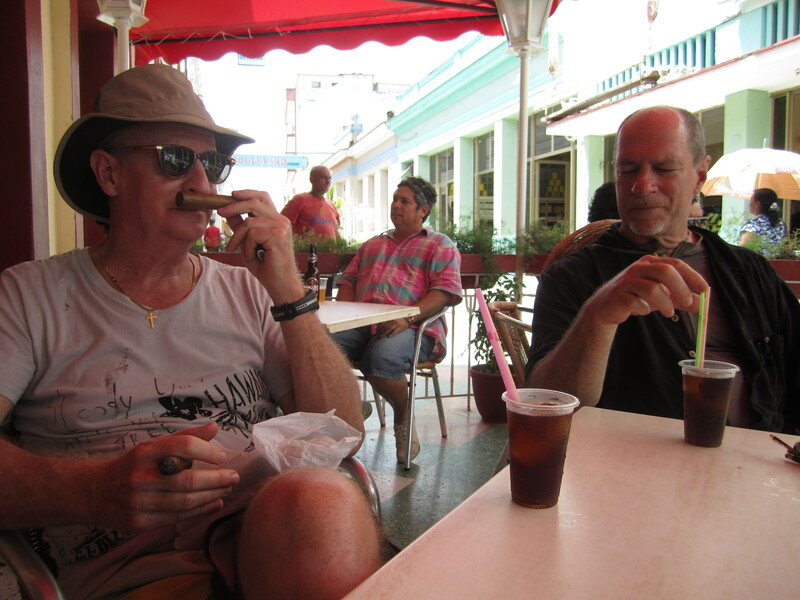 After the tour, we chilled in central Santa Clara, where Steve smoked a cigar, and all of us drank a Cuba Libre, made with their local cola drink TuKola. Cuba is practically the only country on Earth where you cannot get Coca Cola. Maybe that is a good thing. That night we ate for the second time at El Alba, which was the best restaurant we found in all of Cuba. The quality of food in Cuba seems to have no relationship to price, as this was one of the cheapest places. Their specialty is roast pork. Everything was done with care and passion, even though their kitchen is very primitive. The next day started uneventfully. Steve, Alex, and Lyman were going to bicycle the fifty kilometers to Remedios, where we had already reserved a casa particular. I was going to take some kind of public transportation to meet them there. I got delayed in Santa Clara, and did not arrive Remedios until about three. The Casa owner sat me down, and told me that there had been an accident, but he did not know any more details. I did not find out what had happened for half an hour, when Lyman was able to reach me by phone. He was back in Santa Clara at a hospital. They had ridden slowly that day, for an hour or two, enjoying the ride and stopping to look at the sights. They had taken time to check inside a historic church. Lyman had said that he had seen Steve pausing in prayer in the church. A little while later, after getting up from a rest stop, and not having complained of fatigue, Steve had collapsed dead from his bicycle, from what was later confirmed by autopsy to be a heart attack. He was fifty-seven years old. The very least I can say is that Steve died doing what he wanted to do, in the company of his friends who loved him. Steve took two pictures with his cellphone about ten minutes before he died. One was of Lyman, one of himself. Words cannot express how much we miss him already. Another incredible journey. You’ve written a very fine tribute to your friend Steve. I think you’ve captured the beauty of those final days. The pictures, the camaraderie, a long-lasting friendship–you’ve got it all here. Thanks very much Cindy; I really appreciate you reading these things.